They never tested lift off distance either, or even mentioned if you can change the poll rate? Though to be fair this is not the site to look at when meticulously judging gaming mice. That statement requires a lot of qualification that you don't present. Optical mice are better in general IF you are using it on a cloth mouse pad. Laser mice don't perform to their potential on cloth mouse pads. To be fair, this is situation you see most often. 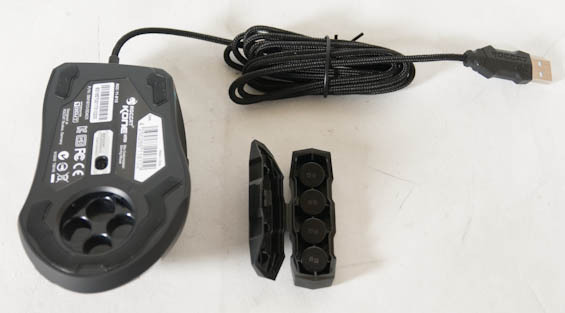 Laser mice track on a wider array of surfaces and are therefore better than optical on surfaces that they have trouble tracking on. Also, it can be argued that Laser is better on rigid, textured surfaces. In general, laser is more sensitive (not to be confused with more accurate). The only inherent advantage/disadvantage between the two is that Laser are smaller and can therefore support higher resolutions. This also means they use a smaller aperture and are more susceptible to dust if they aren't cleaned. In practice, though, laser sensors employ prediction to smooth traces due to the fact that their greater sensitivity reveals jitter in the movements of most peoples mouse movements. Unfortunately, when low ratios of cursor movement per dot (high cm/360), this can also have a negative effect on the mouse movements. Built in mouseaccel isn't universally applied, but like prediction, doesn't really manifest itself very much at high ratios of cursor movement per dot. In conclusion, currently, optical mice are better for people who use a suitable surface and prefer 45cm/360 (rough guess) or larger cursor speed. Lasers are better for people who prefer 15cm/360 or smaller (or have non-optimal tracking surfaces). The cross over point isn't clear. All that said, it doesn't matter how well your sensor tracks if the mouse ergonomics prevent you from moving how you want to in the first place. You just get a well traced crooked line. The Razer Lachesis had such terrible ergonomics that it forced jitter every time you clicked one of the main mouse buttons. Not that it tracked perfectly otherwise, but there was no practical way to snipe even if it were. I bought the Kone+ about a year ago, it ws the most expensive mouse but the mouse didnt live up to the high price. Problem 1. In a very short period of time, the grippy coating wears off and you have finger wear marks on the mouse making it look old and beatup in no time. Problem 2, Changing the driver settings takes a very long time. With so many settings I thought I would test out a few different settings, So you change one setting , then click apply, then wait......and wait.....and wait maybe 20 seconds later the new setting is activated. If you want to test more settings,forget it, it takes so long I just gave up. Problem 3. Driver updates come with firmware and the Roccat update process is by far the worst updating software I have seen in any device in over 12 years. You install the driver, then the automated firmware update invariably fails forcing you to dig into program files to find the stand alone firmware exe to update firmware manually. Drivers wont work until new firmware is applied. Problem 4, Early mice had a dodgy mousewheel problem although I believe they have fixed that one. 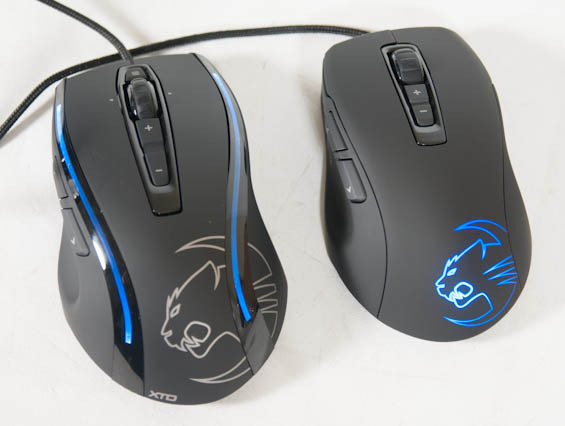 Roccat Kova[+] - it's great. I bought one a while back after watching some youtube reviews and looking at the high res mouse pictures. Has a nice, wide rubber scroll wheel, two buttons on either side (ambidextrous in function and shape) and tracks great. It has the same profile software with the ability to use a shift button function, and has little glowing LEDs that can be changed to cycle, set for a color or disabled. I let it do a slow "breathing" cycle and find that it doesn't annoy me at all. The Mionix Naos 3200 (~$50) is the best inexpensive ergonomic right-handed "gaming" mouse I was able to find. I have medium-sized hands and the mouse shell feels like it was molded specifically for me. I'll second that - I actually bought a Roccat Kone[+] first and while I liked it initially not having anywhere good to rest the ring finger got to being extremely bothersome. On the logitech G5 style there's an adequate ledge to the right of the right mouse button that works quite well for that, but there's no analog on the Kone - instead there's a smaller amount of space at a less ideal angle and a sharp corner. Now I acknowledge that this won't be a problem for everyone as some are fine with having their ring finger on the side, but yeah, that bugged me.